Today, I left to embark on my 6 and a half month journey out of the country. Iâ€™m a nontraditional student at UofL in Economics, Spanish, and Latin American Studies. At 28, I have never been out of Kentucky, let along the United States for over 5 weeks at a time. I feel incredibly blessed because Iâ€™ve always dreamed of living abroad but never, but anxious. I love my life in Louisville and as a University of Louisville student. I will most miss riding my bicycle for six months, as I wouldnâ€™t dare since traffic accidents are a major risk in Buenos Aires. Iâ€™m leaving today for Peru where I am living with the Ursuline Sisters at their Callao mission, volunteering at their school and with them in general, gathering research for my advisor, Dr. Markowitz, and hopefully for my project. Iâ€™m interested in food price inflation and substitute goods, but I need to do some reading before I get too hasty. Then, I am enrolled in the University of Buenos Aires College of Economic Sciences in Argentina from August until December. Hopefully, I will take some side trips to Uruguay and maybe Paraguay. Universal Sink Stopper ($1.63 Lowes) + small bottle of mighty all for little loads (0.99 Target) + nylon rope clothesline $3: In order to pack light and if you donâ€™t have a host family to do your own laundry, expect to do a lot of handwashing. Also, a former COB study abroader Lee informed me that washers and driers are way harsher on your clothes at least where Iâ€™m going in Argentina. My new dress? I donâ€™t think so! You donâ€™t need any more than a week or week and a half worth of socks and under garments. Donâ€™t pack your shampoo, silly! Unless you have to have a certain kind, buy your soap and toiletries there, only pack little hotel sizes to get you through the first few days until you can get to the store. I did bring fancy hair gel. Check with your airline, but carrying toiletries is not worth risking exceeding the weight limit-nor worth hauling around once you reach your destination. (Overweight bags on my flight LAN Peru cost US$300 extra in fines.) Plus, you WILL be hauling some, even if you think you won’t – if only through the airport at customs. Get a haircut (and dentistry work) beforehand. Can you explain to a stylist how to cut your hair in your second language? Also, these services as well as manicures carry a risk for Hepatitis B transmission. Iodine water purification tablets ($10 Gander Mountain) Water is essential to life, so I wanted to make sure I had this emergency measure if I do any country traveling. 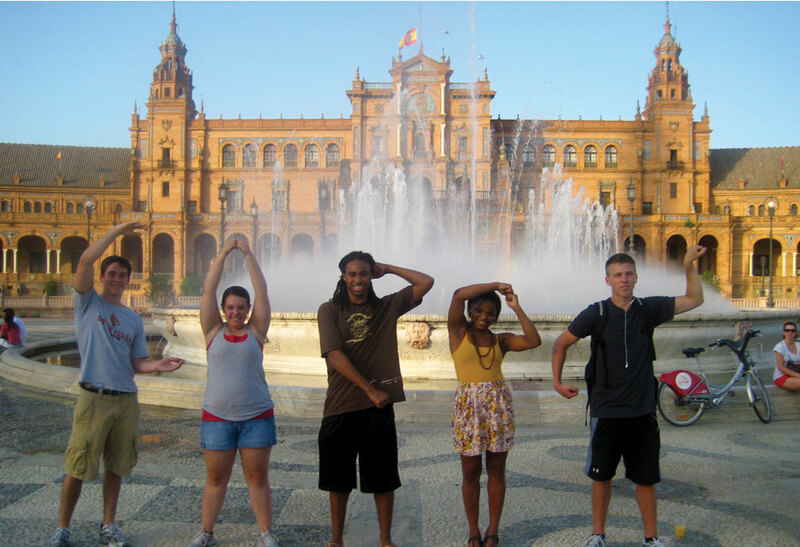 UofL shirt â€“ Show your school spirit while youâ€™re abroad! Gifts: As a Kentucky gal, I brought many little bottles of bourbon to give away. This site has some great non-alcoholic ideas-think Cardinal gear-at the bottom of the page under the category Gifts, but I found it too late. Sea-bands (special order from Amazing Grace, 1 pair $10.50): These look like sweat bands you put on your wrists and are a completely natural way to avoid nausea by putting pressure on your wrist right below your palm. All the anxiety of a new place with new water, plus an international flight with turbulence? You want these. Backup credit and debit card accounts â€“ what will you do if you lose one? Check all the rates online. Capital One is the only company that eats Visa and Mastercardâ€™s 1% foreign transaction fee, so you have 0% foreign transaction fee. WAMU credits cards are the next best with 1%, but you have to have an online bank account to get a credit card with them. Amex has 2% and most other cards charge a 3% foreign transatction fee. Watch the exchange rate and comparison shop once you get there; banks all take a cut because the actual foreign exchange rate is not the rate they give you. Check with your bank about the number of ATM withdrawals you can make; I can make 5 free foreign ATM withdrawals a month. Skype: I have free unlimited international calling via my computer and also to personal phones for $7 a month. I could also forward my calls to a cell phone I rent once I get there for an additional fee. There really is no catch except internet access; Skype is the way to go. Headset for Skype: Keep in mind most electronic equipment will be cheaper in the US. Avoid fees! Check in your expensive, foreign made items, such as your laptop, camera by filling out a simply form with customs at the Louisville airport. Get there 30 minutes earlier and follow the signs to the cell phone lot and employee parking. Otherwise, you may be forced to pay import duty fees on these items upon your return if you canâ€™t prove their US purchase. Copies of all your important documentation, credit cards, passports. This is important if these items get stolen, and this is not an uncommon, unfortunately. Leave some copies with trusted parents or friends in case of extreme emergency so they can help you call and cancel all your cards as soon as possible. Keep credit card copies secure just as you would your cards. Keep one copy of identifying information (NOT your credit card) in your checked baggage in case it is lost. Bring clothes with the intention of leaving them behind to bring back souvenirs. Book light. You may not have a bedside lamp. 20-30% insect repellant for clothes and body. Malaria is rural; dengue fever is urban (there is no cure nor preventative shot). These diseases are serious business, life and limb threatening. Your best bet is prevention. Compass: maps work better with them. Plastic French press coffee maker ($15 but Iâ€™ve had this for a long while) â€“ I will not subject anyone to decaf Emily. Add hot water and beans. Save your Starbucks money and instead spend it enjoying local foods and experiences. DVD-RW in tiny case. Rewritable DVD-RWs back up your most important documents on your computer, taking up little weight and space. Donâ€™t forget to backup those precious digital photos. Online backup is also available. Pillow case: You can stuff it with clothing to make a pillow on the go. Sarong ($20 Just Creations) â€“ My purchase supports artisans, and I have a sheet for the plane, a make shift bag, a dress, a skirt, a wrap, a stylish scarf, all in one. Travel Health clinics: In Louisville, there is Passport Health and the University of Louisville Travel Clinic because many vaccinations you cannot get from your primary care physician. The private clinic has great service but is more costly. I chose to go there because the UofL clinic was on a wait multi-week wait for Yellow Fever.